The Japanese are known for their manga; comics and animation are arguably a much bigger part of Japanese culture than other countries. Part of that means that there’s all types of manga; from manga made for kids to instructional manga and much more specialized manga. But this is Halloween Week, so we don’t care about those kind of stories. Now horror manga, on the other hand, is very much fair game. 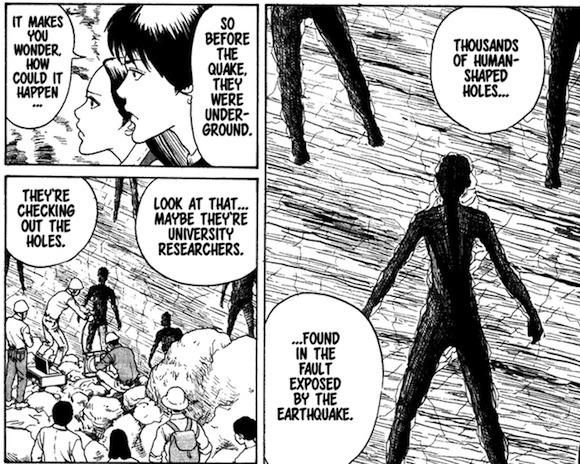 And nobody is better known for horror manga than Junji Ito. 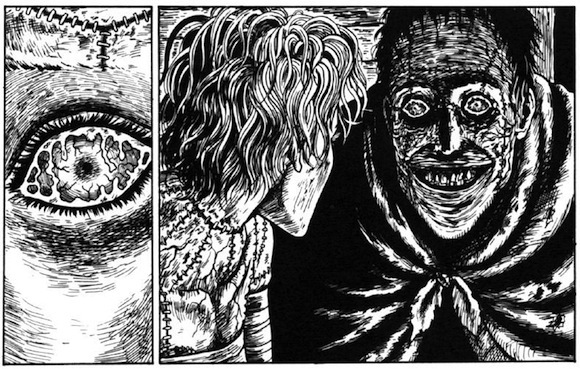 Junji Ito’s is the scariest ex-dental-technician you’ll ever meet. 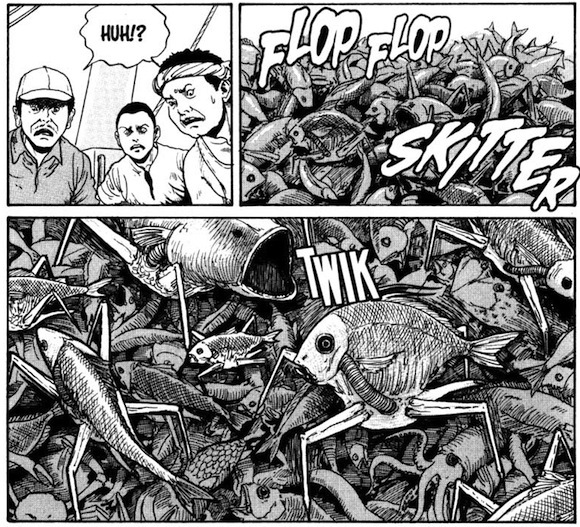 He’s been writing and drawing horror manga for nearly thirty years now, and in that time he’s churned out some of the eeriest, creepiest manga known to man. 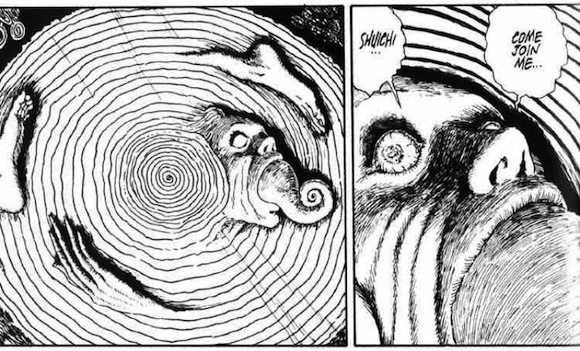 One of Ito’s best stories, in my opinion, is Uzumaki, a story about a town obsessed with spirals. It starts out innocently enough: a man in the town starts collecting objects with spirals on them, but his obsession soon gets out of hand. Slowly, the spiral takes a hold of each and every person in the town. A girl’s hair turns into spirals and takes on a life of its own. A boy sprouts a spiral shell and turns into a snail. Smoke from chimneys begin spiraling into the air. 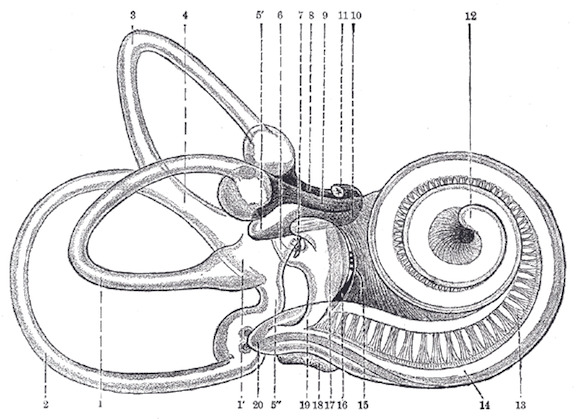 A woman becomes obsessed with her fingerprints and inner ear – the spirals of her body. And like lots of Ito manga, Uzumaki has been turned into a full-length movie. It’s cool to see the manga come alive, but I think that the story is a lot scarier when your imagination generates the sounds, movements, and atmosphere of the town and its inhabitants. Ito has basically reached meme status on the internet with his creepy story “The Enigma of Amigara Fault,” a short story about mysterious, body-shaped holes that open up in a mountainside. Each hole is perfectly shaped like one of the town’s inhabitants, and each one of them feels strangely attracted to these holes. Ito can also get political with his horror manga while still remaining terrifying. Look no further than Gyo, Ito’s story about robotic walkers that emerge from the sea and take over all living creatures they come across. The story reveals that these mechanical monsters were part of a Japanese World War 2 military project gone awry. It’s rare that the Japanese address the militarism of World War 2, so it’s especially impressive that Ito confronts those issues in a manga, of all things. And while Gyo isn’t like some groundbreaking discourse about Japanese militarism, it’s still a bit of a feat for a mangaka. The story of Frankenstein (or Frankenstein’s monster if you want to be pedantic about it), is the classic monster story, at least in Western lore. That’s why it’s interesting to me when Ito takes on the story as his own, putting his own twist on the traditional story. It’s the most gory, frightening telling of Frankenstein I’ve ever seen. The best part of the story is that it treats the monster as more than a giant, flat-headed green goon with lug nuts sticking out of his neck. Ito’s monster does more than moan and scream “FIRE BAD” (although remember kids, fire is bad); instead, Ito’s monster is calculating, articulate, and – most importantly – vengeful. And finally, a favorite story of mine is called “Glyceride,” from the “In the “Voices in the Dark” compilation. The premise is simple enough: a family runs a barbecue restaurant and lives in the space above it. Over time, the grease from the restaurant accumulates in the house, saturating the walls, furniture, and the family itself. The grease begins to change the family. The son, just hitting puberty, grows enormous, greasy pimples on his face. How much does the grease saturate the family’s bodies? Their minds? I think I like this story so much because it taps into a grossness factor that is rarely used in stories.